Here we are with a brand new look as we head into the New Year. The designer has made the site more approachable for us. He promises to teach me all I need to know to keep the site up to date (he is such an optimist). But I am looking forward to learning and incorporating things like a Guest Photos Page that will allow us to upload photos you send us. . It will also enable us to keep you apprised of all specials and last minute openings. Plus the "Latest News" page will be our spot to say "Hi" and pass along any "nature stores" we have witnessed; like the one I would like to share now. The lake is high this year, which means that the river is flowing. Because of the open water we have been seeing the otter quite a bit. They are amazing. Every morning for a couple of weeks we have picked them up in our telescope munching away at breakfast. 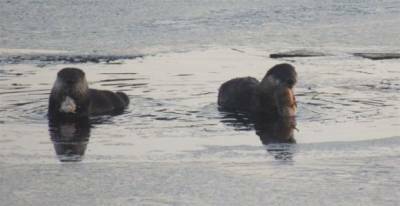 The other morning, just up river from the house Stu and I were watching two otter eating fish they had caught. To our right we saw an eagle coming up river. Just as it got over top, the otters dove. The eagle circled over the spot a few times and then flew into a tree not too far away. It just sat and watched. Suddenly we saw a second eagle coming up stream. He flew in the direction of the perched eagle. Next thing both eagles were flying at each other. There were a few flying thrusts. Then the new arrival maneuvered a position above top the other. After a few minutes of circles and dives, the eagle that had first arrived (the one that had threatened the otter) headed down river and out of view. The victorious eagle perched in a tree. Next thing we saw through the telescope was a raven had landed in a branch just below and he is squawking at the eagle. His feathers on his neck were ruffled and he kept flapping his wings. It was obvious the eagle didn't care what "this raven" was doing. We assumed that the tree may be home to the raven or a favorite perching tree but the eagle was totally unmoved by the protest. 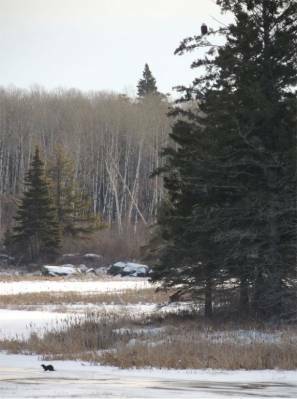 Our eyes glued to the drama in the trees we had not notice that three otter had come up on the ice; right under the tree that the eagle was perched in. One eat. One rolled around on the ice and basked in the sun. The third was just wondering around. All of this under the watchful eye of the victorious eagle. they did not know the eagle was perched above them?? they were taunting the eagle?? the eagle was actually up in that tree watching out for the three Otter and that is why they felt so safe being out on the ice playing. Hope you enjoyed our morning on the river. Please check back periodically for Nature Story updates. Wishing you all a happy, safe and loving Holiday Season!